The Natural Resources Damage Assessment and Restoration Program (NRDAR), working in partnership with other affected State, Tribal, and Federal Trustee agencies, determines the adverse impact caused by oil spills or hazardous substance releases to natural resources the Department of the Interior manages or controls. Then it negotiates a settlement with those responsible, or, if the accused party won’t settle, takes them to court, to garner funds for use in the restoration process, which the Restoration Program then implements. The Natural Resources Damage Assessment and Restoration Program in its current configuration began in 1997. But the passage of the Clean Water Act (CWA) in 1972, and then the Comprehensive Environmental Response, Compensation, and Liability Act (CERLA) in 1980, are what initially led to U.S. Department of the Interior employees working on natural resources damage assessment and restoration. CWA was established to offer Federal protection to the country’s waterways, and CERCLA defined natural resource damage assessment as “the process of collecting, compiling, and analyzing information, statistics, or data through prescribed methodologies, to determine damages for injuries to natural resources.” In 1990 the damage and restoration work by the Department of the Interior staff received additional legal authorization with the passage of the Oil Pollution Act (OPA), which shored up the government’s ability to prevent and respond to oil spills. In 2004 President Bush issued an Executive Order on Cooperative Conservation, calling on Federal agencies to strengthen interagency coordination and cooperation with States, Tribes, landowners, and others, to enhance environmental performance, which further steered the Natural Resources Damage Assessment and Restoration Program in its progression. Then in 2005 the Secretary of the Interior chartered a National Resources Damage Assessment and Restoration Advisory Committee to provide advice and recommendations on issues related to the Restoration Program’s implementation of natural resource damage statues and regulations. The Committee consists of 30 members, selected from Federal, State, and Tribal agencies, as well as representatives from business and industry, the academic community, and national and local environmental groups. The objective of the Natural Resources Damage Assessment and Restoration Program is the timely restoration of injured natural resources to the conditions that would have existed had they not been injured. Coordinating the efforts of several bureaus and offices toward that result, the Restoration Program manages the technical, ecological, biological, legal, and economic angles of cooperative assessment of natural resources damage, and recovering of funds, in cash or in-kind services, to then use to finance or implement the restoration process. The duties are delegated based on the specifics of each case among: the Bureau of Indian Affairs; the Bureau of Land Management; the Bureau of Reclamation; the National Park Service; the U.S. Fish and Wildlife Service; the Office of Policy Analysis; the Office of the Solicitor; and the U.S. Geological Survey. The first step is damage assessment, thoroughly identifying and understanding the nature and magnitude of the injury. Then the Restoration Program aims to negotiate a settlement with the responsible parties for the cost of the restoration, interim loss of use of the resource by the public, and the money it costs to assess the damages; if a settlement isn’t possible, the Restoration Program is authorized to take the individuals to court. Funding for the projects may come out of a combination of the money recovered, via settlements, or court findings, and a yearly government appropriation, while trustees (States, Indian tribes, other Federal agencies), or foreign governments, can also fund assessments. 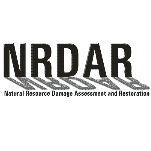 In addition, according to the NRDAR, companies and other parties responsible for having caused damage are invited to participate, with trustee oversight, in the development of assessment and restoration plans, and on several occasions have even provided input into the selection of various injury studies, and contributed funding toward assessment activities. Selection by the Restoration Program of which projects to take on is done on an annual basis. Questions covered in making these choices include: What is the likelihood the recovery of funds will occur? Does it demonstrate sufficient technical, legal, and administrative merit? Among Natural Resources Damage Assessment cases: Chalk Point Oil Spill in Maryland, which restored 1,850 acres of nesting habitat to compensate for lost ducks injured or killed in an April 2000 oil pipeline rupture; Lower Fox River/Green Bay, Wisconsin, which addresses natural resource injuries caused by polychlorinated biphenyls from discharges of paper mill waste; and Hudson River, New York, which deals with natural resources injuries that occurred because of the release of hazardous substances, particularly PCBs, into the Hudson River, primarily from GE’s Hudson Falls, and Fort Edward, New York manufacturing plants. Steve Glomb is married to Barbara (Ehst) Glomb, with whom he lives in Alexandria, Virginia. The couple has a daughter, Alyssa Glomb, who was born in 1992. Frank DeLuise, who has been with the Restoration Program since 1998, earned a B.S. in Biological Science in 1972 from Fordham University in New York and an M.S. in Marine Science, in 1975, from New York’s Long Island University. In 1975 he began his career at the U.S. Fish and Wildlife Service (FWS) as a staff biologist in its Cortland, New York field office. After that, he moved to FWS’s Long Island office, in 1979, where he became Supervisor. In 1984 he moved to Washington D.C., becoming FWS Assistant Chief of the Branch of Federal Permits and Licenses, then Chief of the Branch of Federal Activities, and, as his final FWS position, Chief of the Division of Environmental Contaminants. In 1998 DeLuise was appointed Deputy Program Manager of the Natural Resource Damage Assessment and Restoration Program, and in 2000 he was promoted to his current position.